McKINNON – Dennis Gordon, 80, of Liverpool, Queens County, passed away peacefully in Queens Manor, Liverpool on Sunday, October 21st, 2012. Born in Mill Village, he was a son of the late Parker and Mae (Hirtle) McKinnon. Dennis was a former employee with the Clothing Department of Bowater Mersey Paper Company for 38 years until his retirement. 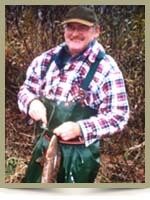 He enjoyed hunting and fishing as well as sports such as bowling, golf, curling and baseball. He is survived by his wife, the former Marilyn Allen; his daughters Denise (Douglas) Fawthrop of Halifax and Laurel (Edwin Gauthier) of Oshawa, Ont. His son Timothy (Rebecca) of Eagle Head. seven grandchildren and eight great- grandchildren. His brothers Irving (Vida) of Port Medway, Donald of Halifax and Eugene of Ontario. He was predeceased by his sisters Kathleen, Hilda, Ruth, Doris and Gloria and his brothers Frank, Max and Earl. Marylin, Tim, Denise and Laurel (and families): you all are in my thoughts at this sad time. Your family is another from my childhood, with memories of Dennis and dad doing the fishing and hunting thing. Someday ask mom about the salted makerel he found in our basement at home. I’ll never forget the story as dad told it! Take care. Tim & family, Very sorry for your loss. Prayers to you all. It may have taken Dennis “the long way around” to tell a story or joke but it was always interesting. I hope he is “on the river” with hopes of getting the big one that got away. R.I.P. Dennis. Sincere sympathy to Marilyn, Tim & Becky, Laurel & Edwin and Denise & Doug and families, I will be thinking of you in the days ahead as you deal with your loss. We were so saddened when we heard of Dennis passing . Please accept our sincere condolances . We so enjoyed seeing him at our last visit to the Manor and hope he felt the fun and music with us. Take comfort in knowing that others care. You are in our prayers. Sorry for your loss in the passing of Dennis. I am so saddened to here of Dennis passing I always liked to visit with you and him, while I was with Lucie and her crazy adventures. I loved the way Dennis used to tell his jokes and joke around all the time. Although he might be gone to a better place he will surely be missed by many. My thoughts and wishes are with your entire family. thoughts are with you and the family. Will see you on Thursday. Marilyn and family, so sorry to hear of Dennis’s passing. Our prayers and thoughts are with you all……….. Although we know in our heads that we will have to face this day, our hearts are never really ready. Our thoughts are with you at this time. Marilyn, my thoughts and prayers are with you. I imagine Dennis is fishing on the river with Dad now and talking about the big one that got away and I know they will be waiting for us when we get there. Tim and family, please accept our condolences at this time. Sorry for your loss. Thinking of you during this sad time. Our sincere condolences on the loss of your father…………. Sincere sympathy to all of you, Dennis will be missed. Dad will have a friend to share fishing stories now, as they did in the past. You will have fond memories always …take care. Please accept our condolences in the loss of your husband and father. He will surely be missed. To all the Family, so sorry to hear that Dennis has passed can remember the times when I came to your house in Mill Village, he always had a story to tell take comfort in your memories an the love of family an friends an know that God will give you peace. I have had the absolute pleasure of getting to know Dennis at Queens Manor. I spent time with Dennis, I enjoyed his stories as a young child, especially ones that included my grandfather (his cousin), Dennis was kind, gentle and he warmed my heart upon every visit I had with him. I will miss him personally and professionally. My mother and I would both like to extend our deepest sympathy to your family. I was so sorry to hear of Dennis’ passing from Karen. Our condolences can’t ever make up for his loss, I know, but I just wanted you to know that he will always hold a warm spot in our hearts. You and Dennis have always felt like part of the family since the day we met you. Even if you know someone’s passing is coming nearer every day you are never ready when it does happen. My sincere condolence to the MacKinnon family.It was a true pleasure having known Dennis.He was a great friend to work with in the mill,had a good many laughs from his jokes.R.I.P. my friend. Sorry to hear of your Uncle”s passing . Our thought’s are with you all. So sorry to hear of Dennis passing. Dennis and I have had few talks together. He will be greatly missed by the community and all who knew him. Keep all of your great memories in your hearts always. Marilyn and family, We are so sorry for your loss. Dennis was a wonderful person that we will never forget. We are grateful to have had his friendship and will surely miss him. Our sincere sympathy goes to all of you during this sad time. We do still have our memories of good times shared. Dennis is now at peace. We are very sorry to hear of Dennis’ passing. Our thoughts and prayers are with you. We were saddened to hear of your loss…know that you all are in our thoughts. Take care. Carol J. and your yoga friends. We are sorry to hear of your loss our thoughts are with you and your family. were around the same age are together again.Keep strong and rely on each other. We were with heartfelt in sorrow for your loss, Dennis was a good friend he will be missed. Comfort to all of the family in this sad time. God bless you all. We are so sorry to hear of Dennis passing. Our prayers and thoughts go out to you all. Wendy and Fred Wamboldt. Marilyn, we are very sorry to hear of your loss in Dennis’ passing. We always talked to him at the nursing home when visiting there. We will pray for you and your family. So sorry to hear of Dennis’ passing. Our deepest sympathy to you all. We will keep you all in our thoughts and prayers. So sorry to hear of Dennis’ passing. He was a good friend in years gone by, and again in more recent years. He will be missed by all who appreciated his great sense of humour, and the Medway will miss his ‘washing of fishing line’. God bless. So sorry to hear about Dennis, our thoughts are with you all at this sad time.